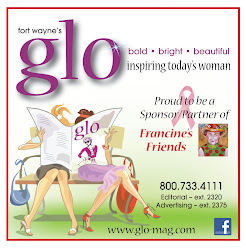 After our friend, Francine Schubert, lost her battle with breast cancer, several of her friends met to find a way to not only honor Francine’s spirit and drive, but to provide life saving services to women in Fort Wayne and the surrounding area who might otherwise be unable to receive them. Our goal to establish a mobile mammography unit to serve the women in the area who are unable to access this important screening was reached in the fall of 2005. We had the support of our partners at Parkview’s Comprehensive Cancer Center and the Breast Diagnostic Center, Radiation Oncology Associates, Indiana Surgical Specialists, Physician’s Health Plan, The Lutheran Foundation, Women’s Health Advantage, United Way, and the over 400 women who attended our first fundraiser in October of 2005. Once our dream became a reality, the real work began and continues to this day. Early detection is the best weapon in the fight against cancer and finding breast cancer in its earliest stages increases the survival rate to an astounding 95%! Screening mammography continues to be the best tool we have to detect breast cancer early. For over a decade, we have been able to provide screening mammography to women who might not have access due to lack of insurance or transportation. It helps us find breast cancer in its earliest stages and increase Indiana’s survivorship of this terrible disease. 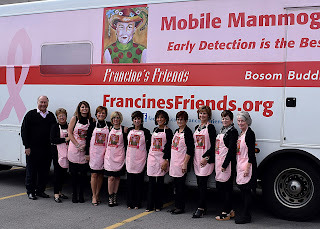 The purpose of Francine's Friends is to provide mobile mammography screening and follow-up services to every woman who might otherwise not have access. Midwest Pipe and Steel, Inc.